Amidst the beautiful snow capped Andes Mountains and the clear turquoise color of the Rio Puelo there is a place surrounded by tranquil peace and natural surroundings. A place even early explorers overlooked and to this day no roads penetrate this unique area. A place where the locals you encounter along the path to the nearby village, still greet you with a warm smile and a cheerful "buenos dias". A place where the ox cart and horse are still valued in an area where there are no roads to the remote local villages and farms. A place where the Alto Puelo Lodge sits comfortably blended in with the character of the region. A place that is perfect for a memorable and secluded private fly fishing vacation. During the fishing season, Alto Puelo Lodge has a limited amount of available space for your own private vacation. Included in this package is private use of Alto Puelo Lodge, a personal chef, personal guide (or guides depending on the size of your group) and an unlimited amount fly fishing as well as other activities. This is a great package for individual groups and families. These packages are limited and book fast, so please reserve your private vacation early. Individual Groups - Many individual groups that are avid fly fishing enthusiasts come back to the lodge year after year not only for the fishing and comfortable amenities but for the privacy of their vacation..
Alto Puelo Lodge is located in the Andes Mountains of Patagonia. The lodge is six miles from the Argentina/Chile border and sits on the Chilean side of the border. The lodge commands a view of the turquoise blue Rio Puelo. The source of the river Puelo originates from high mountain glaciers along the border on the Argentine side (east), flowing through the Andes Mountains and out to the Pacific Ocean (west). We take great pride in our service, meals and lodging. It is our job to make sure you catch fish, eat well, sleep restfully and enjoy your holiday with us. The lodging and meals, along with the wines are superb. Check out our Itineraries and Rates for further information under Alto Puelo Lodge. The lakes and rivers that surround the Alto Puelo Lodge have very good fishing. You will be able to fish for trout in the river using different methods. We do drifting, wading and casting to fish that you can see feeding on the surface. Excellent dry fly fishing during the day and evening hatches are most remembered. The fish are brown and rainbow trout with the average size 18-21 inches. This is one of the safest places on earth to be while enjoying your vacation. The crisp clear lakes and rivers, the snow covered mountains, and the great fly fishing makes a memorable and rewarding vacation Contact us for your next fly fishing vacation and experience Alto Puelo and come see the true beauty of Chile and Argentina. This secluded paradise is about two hours by car and one hour by boat from San Carlos de Bariloche, Argentina. 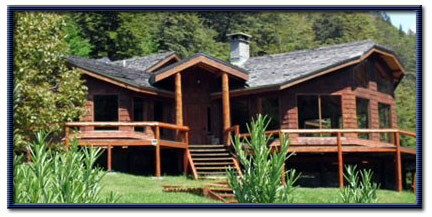 Our staff will meet you at San Carlos de Bariloche and transfer you to our lodge. The boat ride takes you though the Puelo National Park and across two lakes from Argentina to Chile. The one hour voyage by jet boat is exciting, yet pleasurable. To get to San Carlos de Bariloche, Argentina where we meet you can be done via Buenos Aires ,Argentina by a domestic carrier or from Santiago, Chile (Lan Chile Airlines) has flights to San Carlos De Bariloche. This is one of the safest places on earth to be while enjoying your vacation. Contact us for your next fly fishing vacation. Come to the Alto Puelo Lodge and come see the true beauty of Chile/Argentina and the great fly fishing.